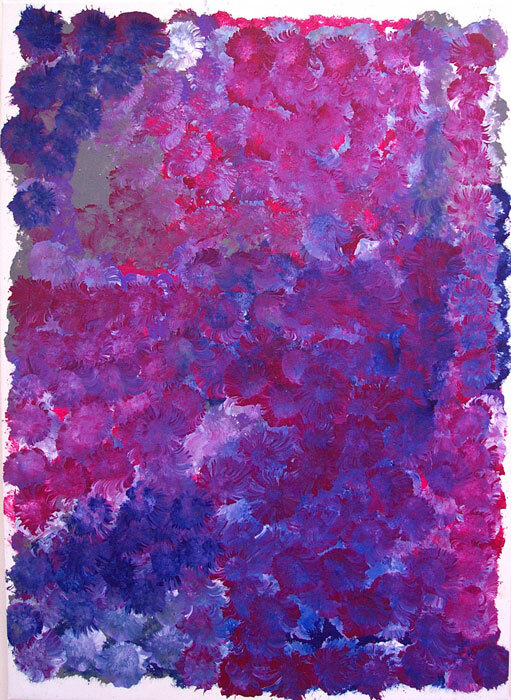 Emily Kame Kngwarreye has depicted her Mother’s Country, expressing the rich vegetation and movement of the desert landscape. Stories Awelye (women's dreaming); Arlatyeye (pencil yam); Arnkerrthe (mountain devil lizard); Ntange (grass seed); Tingu (a dream time dingo pup); Ankerre (emu); Intekwe (a favourite food of emus - a small plant); Atnwerle (green bean) Kame; Atneltyeye country; Alhalkere country. Emily is recognised, worldwide, as one of Australia’s most significant artists in the late 20th Century. Her paintings have influenced a change in the direction of Australian Aboriginal art from the use of traditional iconography to an open abstract landscape. Emily was born at Ahalkere in the Utopia Homelands, and was the adopted daughter of Jacob Jones, an important Law man. She learnt ancestral stories, song cycles, traditional body paint secret- sacred markings for women’s dancing ceremonies, and became a leader in women’s ceremonial business. Working as a stockhand, she became very familiar with the Utopia landscape, and her paintings are maps of her traditional lands. A bold, forceful and strong woman, her paintings, with their immediacy and strong, definite and sure lines painted the Utopia of her ancestors in the last ten years of her life. Emily painted the abstract markings of ceremonies and the landforms of her country of Alhalkere with its distinctive arched rock formation. Emily painted the “whole lot”, celebrating her country in Utopia.